The Phytosome® process is a patented technology (U.S. Patent #4,764,508) that combines herbal extracts and sunflower phospholipids (lecithin). Phytosome®s are created when the standardized extract and active ingredients of an herb are bound to the phospholipids on a molecular level. The newly created Phytosome® structures contain the active ingredients of the herb surrounded by the phospholipids.The phospolipid molecular structure includes a water-soluble head and two fat-soluble tails. Because of this dual solubility, the phospholipid acts as an effective emulsifier. An emulsifier is a material that can combine two liquids that normally will not mix well together. By combining the emulsifying action of the phospholipids with the standardized botanical extracts, the Phytosome® form provides dramatically enhanced bioavailability and delivers faster and improved absorption in the intestinal tract. And, because not all botanical properties are as bioavailable as others, joining them to phospholipids produces an effective medium for increased absorption of the active constituents of the herb. Without the Phytosome® process, a reduced amount of the botanical extract and its active ingredients, which are usually non-lipophyllic, permeate the intestinal lumen. By creating the Phytosome® complex of herbal extract and sunflower phospholipids (lecithin), the result is a new dosage structure that is more rapidly absorbed and more efficiently used by the body. Research has shown that an herbal Phytosome® is more biologically active, therefore, it provides all the benefits of botanticals at reduced dosage. This means your body utilizes and absorbs more of the beneficial properties of herbs so you can take less and still achieve the herbs desired results. 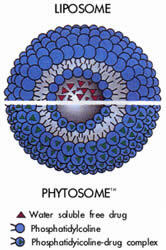 Read what Michael Murray, N.D. has to say about the Phytosome® process.